The Czech Constitutional Court has adjourned until next week a hearing into what could be the last legal challenge to the EU's Lisbon Treaty. It had been considering a case brought by 17 Eurosceptic senators who say the treaty would create a superstate, and as such infringes Czech sovereignty. The treaty, which aims to streamline the way the EU is run, must be approved by all 27 member countries. The Czech Republic is the only country which has yet to sign. Court officials in Brno said the 15-member Czech Constitutional Court panel would reconvene on 3 November when a ruling was "very probable", the Reuters news agency reported. The BBC's Rob Cameron, in Brno, says that the court has received several additional petitions in the past few days, and some observers had believed that the judges may need more than one day to decide. 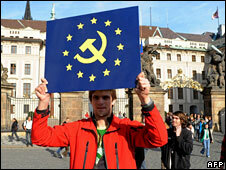 The court challenge is one of two hurdles to be cleared before Czech President Vaclav Klaus will sign the Lisbon Treaty. A similar case has already been dismissed, but the president - a Eurosceptic who strongly opposes the treaty - still has to sign it to complete ratification. He has said he will not do that unless provided with solid guarantees about property rights in the Czech Republic, a subject which will be addressed by a summit later this week in Brussels. Our correspondent says the EU is keen to get on with the task of implementing far-reaching reforms, including the appointment of a new permanent EU president, but is being frustrated by the lack of Czech ratification. The Czech parliament has already approved the treaty. The Lisbon Treaty is also under threat from the UK's Conservative Party. They say they will hold a referendum on the treaty if they form a government next year, and if it is not signed into law by then. Speculation is mounting about possible candidates for the two new powerful posts that Lisbon would create - the President of the European Council (EU president) and the High Representative for Foreign Affairs. UK ministers say they would welcome former UK Prime Minister Tony Blair becoming EU president, though he remains tight-lipped about whether he will bid for it. However, BBC Europe correspondent Dominic Hughes says Belgium, the Netherlands and Luxembourg are among smaller EU countries that believe the president should come from a country that uses the euro and is part of the border-free Schengen Agreement.